For starters, TAA is short for Trade Agreement Act — a federal act that’s about…well, trade agreement. The US Congress and Pres. Jimmy Carter put this particular Trade Agreement Act into law in the tumultuous year of 1979. (There were, in fact, precursors to the ‘79 law.) The laws require that bulk products bought by federal agencies from foreign companies have some degree of production done in the United States. The minimum purchase standard is around $193,000, but some countries can work around the standard if they have a special trade agreement. If you really want to look at the complicated details, you can check out the official guide at: http://goo.gl/M2dLiN. Pertaining to us, LINKYO is an American company that manages and distributes in the USA. 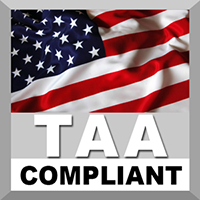 It is, therefore, proudly compliant with the TAA. So whenever you see “TAA-Compliant” logo on any of LINKYO’s product pages, take comfort in knowing that you have an item made in or assembled in the USA.